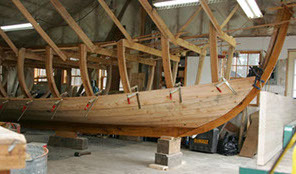 dedicated to the construction, preservation and restoration of wooden boats. Andrew Wallace, founder of Traditional Boatworks, has a love of wooden boats rooted in his Norwegian heritage. He began his initial training in traditional wooden boat building in 1994 at the Maine Maritime Museum's Apprentice Shop in Bath, Maine. From 1996 to 1998, he worked at the John Gardner School of Boatbuilding in Annapolis, Maryland, serving a part of his tenure as Head Boatwright. In 1998, Andrew founded Traditional Boatworks, serving clients along the East coast from Maryland to Maine. 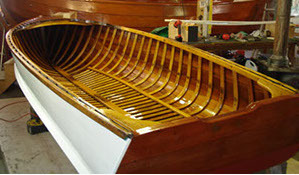 In addition to building custom small craft, Andrew undertakes restorations of all types of traditional wooden boats. Working closely with naval architect and designer Tim Estabrook of Estabrook Yacht Design, we can design, build or modify the boat of your dreams. 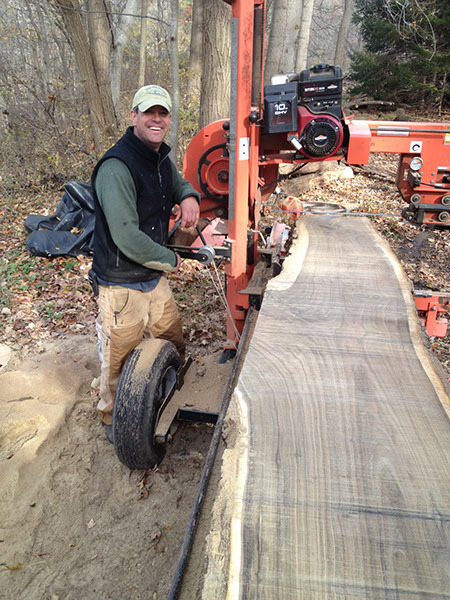 In 2013, Traditional Boatworks expanded its capabilities to include custom sawing of quality logs for furniture making, boat building and interior architecture....from forest to finished product with an emphasis on sustainable forestry practices. New 24 foot Snekke under construction.